« What Type of Blogger Are You? 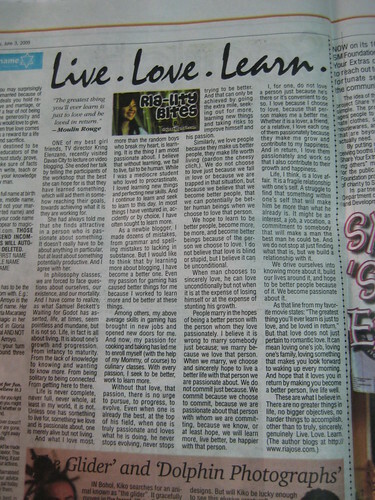 I am now a weekly columnist at the number one local newspaper here in Davao City, SunStar Davao. My first column was published today, with the column title, “Ria-lity Bites.” The title was suggested by my blogging buddies. I am under the Lifestyle section but I can write about or feature almost anything. For my first column, I decided to write something introspective entitled “Live. Love. Learn.” I chose the topic to represent who I am and the varied themes, issues, topics, events, and things that I will be writing about in the coming days. For the meantime, I am writing once a week, published every Wednesday. I will be writing about a lighter topic next week. I will be writing about something a little bit different every week but all of these will be (hopefully) interesting and will reflect my different passions. Most will be likely be tied to the topics and niches of my different blogs. Congratulations Ri! I have read it from the link you posted and I enjoyed it so much. You always write to express and not to impress gurl. I love it- simple, raw, honest and straight from your heart. TWO THUMBS UP! wow.. really nice.. congrats ria! WOW… JUST WOW. I’m really honored and grateful. Just want to know how I can write an article regarding Improving your Financial wellness. I hope you can assist me on this.